Hey, look! 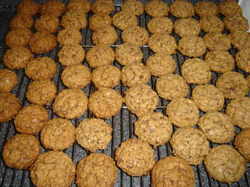 A field full of cookies! You can have plain old chocolate chip cookies anytime, but how do you make them a little more interesting? Easy: Pump up the vanilla, the obvious yin to chocolate's yang. I use a triple shot of vanilla in this cookie: ground up Nilla Wafers, instant vanilla pudding mix, and extra vanilla extract. Throw in some mini semi-sweet chocolate chips, and you've got a great little cookie with great big flavor. I use the pudding mix and NIlla Wafers here the same way I use graham crackers in my S'mores and Golden Girls cookies. It's not quite "Semi-Homemade," but it sure does brings home the flavor. In a small bowl, combine the wet ingredients. Whisk together the wet ingredients and add to the creamables. Mix together until smooth. Shape dough into balls—about 2 tablespoons each. Place chilled dough balls about 2 inches apart on Silpat- or parchment paper-lined cookie sheets. I am a BIG vanilla fan!! I usually prefer it to chocolate so this is the perfect cookie for me. I can't wait to make it. I did make the smore's last weekend and they came out terrific!! I tried your Va-Va-Vanilla cookies this weekend, and they are awesome! Some family was over for Easter and proclaimed them the best oatmeal cookies ever. Thanks for the recipe! I used dark brown sugar, is that what I was supposed to use? Some of them didn't keep their shape very well and were very soft (but still delicious). I brought them to class to share (I'm in college) and everyone raves about them and demanded the recipe. One of my favs so far. Hi, Em. Yes...dark brown sugar. (I've updated the recipe to say "dark" specifically.) Hmmm...maybe they needed another minute or so in the oven. Wow! I'm impressed: you're doing all this baking AND going to school. Geeze...when I was in college the most cooking I did was microwave popcorn. Kudos to you!! Oh. Here's another tip for baking flawless cookies: invest in a Silpat or silicon baking mat. You'll get perfect cookies every time. how many cups of chocolate chips would you add to the batter? sounds yummy... trying it for my cookie gifts this year. Hi, Kendra. D'oh! I left the chocolate chips out of the recipe grid. Sorry about that! I just added them...1 1/2 cups mini chocolate chips.